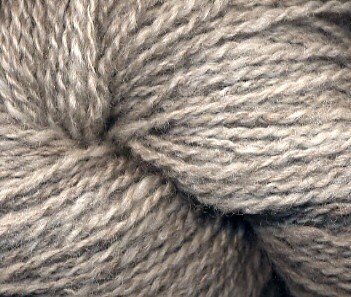 I spent two pleasant days carding and spinning my CVM fleece. Since the staples were about 5 inches long, I used my drum carder to prepare them. Whenever I prepare fleece for woolen spinning, I automatically think "hand cards," but really, anything over 3 inches in length really isn't suitable for hand carders. Then when I use drum carded batts for longdraw spinning I think, well, this technically isn't prepared correctly for a true woolen yarn. However I never let that stop me! Most of the 2 ounce sample measured 6 crimps per inch, I decided to spin it with 6 twists per inch. Since I wanted to spin it longdraw, I consulted one of the appendix in Mabel Ross's The Essentials of Yarn Design for Handspinners. Well, actually it equals 10.28, but who's going to quibble about that! This stuff was lovely to spin. It is soft, lofty, and delicious; full of subtle variations of gray and just enough luster. I don't have anything specific in mind for this yarn, but it makes me want to spin more of it. It would make a fabulous sweater of vest. And since Cathy has offered such an encouraging comment nudging me in that direction, I probably won't wait too long to indulge myself! Your spinning is beatiful. When you got to the number-of-treadles part, I covered my ears and hummed loudly, as that kind of math and precision goes beyond my area of expertise in spinning. But the result is fantastic. Lovely fiber....lovely yarn...well done, Leigh! Hmm. Now you've given me an idea. I recently made a fiber trade and for my end received 10 ounces of heavenly black rambouillet. These might make a dynamite 2 color vest combo! Hi Leigh -- how gorgeous! Spinning is still the one area in the fiber world that I have yet to gain any expertise at all (even rudimentary!) and I so envy and admire the spinners out there. You just have such a great eye for color and a mind for precision, it is no wonder that all of your work is lovely. Yours is one of my very favorite sites to pop into with my morning coffee. Wish you lived close by!! Thank you so much Jane, you've made my day!! Spinning looks like so much fun and so satisfying. I keep wishing for a spinning wheel, but I've told myself I must spin all the roving I have (which isn't terribly much) with the drop spindle I have before I even begin to think about getting a wheel. Your posts help provide the inspiration - now I just need to get to it!